This Encinitas hot tub service customer was having an issue with the water in their in-ground mosaic tiled hot tub or spa. The water was not clearing up after vacationing tenants would leave. The old hot tub or spa filter was older, somewhat undersized, and the internal elements were not cleaning the hot tub properly. The solution was to install a new Pentair Clean and Clear cartridge filter to fix the issue of water clarity. Our Encinitas spa or hot tub cleaning service customer was having an issue with the overall water clarity. 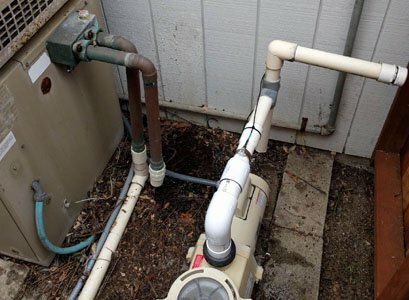 Regardless of the proper water chemistry, circulation times and performing a hot tub drain and clean, the water would not clear up. This is when we realized that there was a problem with the old Sta-Rite cartridge filter. Upon attempting to perform the Encinitas hot tub repair, we decided based on the overall condition that we should install a new filter. When we contacted or hot tub service customer, we did not recommend that we perform the hot tub repair but instead install a new filter. We then sent her a quote for the work that was needed and she agreed to have us complete the new Pentair cartridge filter installation at her house in Encinitas, CA. As with all types of hot tub or spa repairs, we always send out a written estimate via email for confirmation. Our company also performs a free pre-site to ensure we know the exact scope of work and what specific spa or hot tub equipment will work. A new Pentair Clean and Clear 200 sq ft cartridge filter was the best filter for this Encinitas in-ground hot tub. 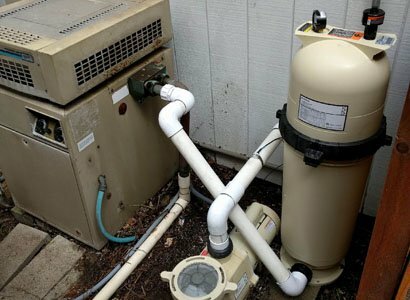 This Pentair filter is a good option as it has a good enough size to handle the demands of this hot tub being used at a vacation rental. Our hot tub repair technician started by removing the old filter and getting the new one positioned to where it will work best. 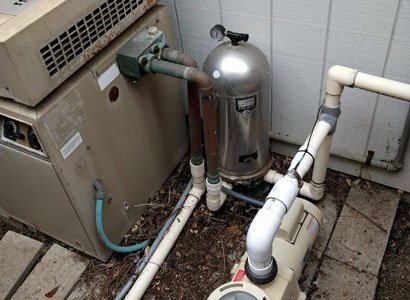 As you can see, the hot tub filter installation position was moved from behind the spa pump and next to the spa heater to the other side of the WhisperFlo pump. This allowed for our hot tub repair tech to get the best spacing and to have the plumbing as clean as possible. 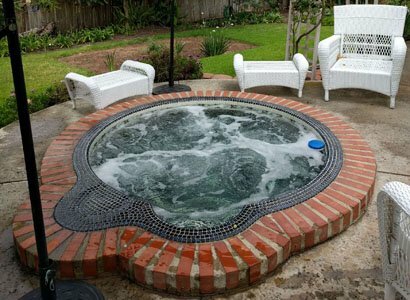 We perform these types of hot tub repairs and hot tub cleaning services throughout San Diego County. If you have a spa or hot tub and need and services or repairs, we can help.